Some of the best music on TV can be found on Cartoon Network’s incredible Steven Universe. Just like any great cartoonist, Rebeca Sugar knows that if you want to craft a kids’ show with heart, throwing in some great songs is one of the strongest available tactics. Sugar already has a strong collection of Adventure Time songs under her belt, and with Steven Universe, her music works to pull viewers in to a show already heavy with emotion and complicated narrative. Catch up on the best Steven Universe songs (or all of them) before the Gems return for four weeks of all-new episodes (including the musical episode “Mr. Greg!”) in honor of the Summer of Steven. The following songs aren’t only some of the catchiest and most heartfelt, but they also reflect some of Steven Universe’s most important lessons and narrate powerful stories. Check out our ranking of the best songs from Seasons One and Two, and share your favorite Steven Universe jams in the comments below. Sometimes Steven Universe gets so complicated and heavy we forget about the show’s jovial, just-plain-adorable moments, like Lars and Sadie’s “vacation” to Mask Island. In Beach City, Lars is too caught up on issues like popularity, but removal from society gives him the opportunity to embrace love (“Isn’t it nice to find yourself somewhere different?”). “Island Adventure” runs before Season One starts getting more intense, and before the plot thickens, we’re left with an important reminder: we make music because it feels good, and when it’s possible, enjoying our existence is necessary. Aside from making almost everyone fall in love with young Greg (Tom Scharpling), “Comet” really counters what viewers may have thought about him at the beginning of Season One. Greg Universe is not a washed out wannabe, but a talented musician who altered his path for love. Here, and for the next few minutes, we’re exposed to young Greg’s potential (and we also see where Steven gets his skills). Maybe Greg never got to take a space train to the cosmos, but he found something just as meaningful and eccentric in his relationship with Rose. The extended theme song was first introduced in the pilot episode, but watching a tiny Steven (Zach Callison) sing and strum his heart out for the Gems is far more sentimental. Aside from giving us serious feels, the song teaches us a lot about Steven’s early life through the extension and watching the gems assume Greg’s role as caretaker. The passage of time segues into each Gem’s personal mission and relationship with the earth, so by the time it gets to the part we all know by heart, we know exactly what each Crystal Gem is fighting for. Debuting relatively early in the first season, “Strong In The Real Way” asserts one of the show’s most powerful parables—emotional strength is just as valuable as physical prowess and often overpowers it. Pearl’s Pearl (Deedee Magno Hall) verse makes her values clear (“Don’t you know that a power that big comes with a bigger expense?”), and “Coach Steven’s” conclusion solidifies the importance of intellectual strength. However, it’s important to note that Steven’s verse, the closest the show comes to an inspirational sports montage, doesn’t portray physical strength as weak. Rather, we see that Steven is doing the right thing for the wrong reason. Garnet’s origin story “The Answer” was just nominated for an Emmy, and there’s no way this song didn’t have anything to do with it. The beginner’s ballad of Ruby (Charlyne Yi) and Sapphire (Erica Luttrel) accurately reflects the curiosity and excitement that new relationships pique. Lyrically, it’s awkward and adorable (as getting to know someone often is), and as the song progresses, we learn that Sapphire’s call in “Jail Break” and Garnet’s motif in “Stronger Than You” originated from Ruby and Sapphire’s first intended fusion. She really is love. In the episode of the same name, Steven is traumatized by “The Return” and “Jail Break’s” events and hasn’t even had time to process them, when Connie starts blowing up his phone to find out if he’s okay or even alive. Without the time or counsel to grasp the events of Season One’s finale, Steven designates himself a burden to his closest friend (“And I have to protect you/What if somehow you get hurt?”). Soon, Steven’s cellular anxiety works its way into the score for “Full Disclosure” and cleverly crescendos until he deflects Connie’s call. Lastly, Steven’s smart not to throw his phone into the ocean, but wouldn’t it have made a fantastic closing scene? Figuratively speaking, Peridot (Shelby Ann Rabara) is a tough Gem to crack. 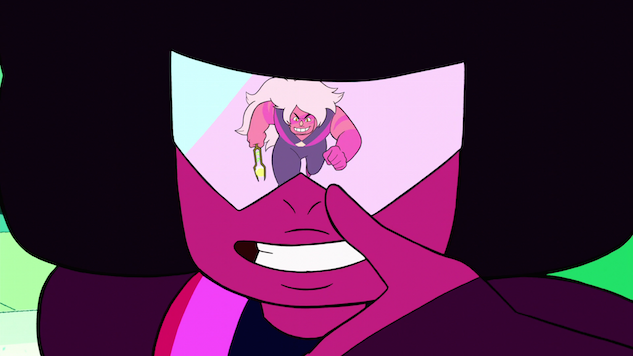 At the time of the release of “Too Far,” viewers know she’s only collaborating with the Crystal Gems because she’s stuck on earth and doesn’t want to die, and it’s taken an entire season for her to even reach this point. “Peace And Love,” then, is the most she’s let Steven in so far, and reveals that in addition to a new understanding of teamwork and appreciation for the earth (which quickly expands in “Message Received” and “Log Date 7 15 2”), Peridot’s gained a sense of sympathy for her former rivals (“I think you’re all insane but I guess I am too/Anybody would be if they were stuck on earth with you”). “Sworn to the Sword” isn’t the first time we’ve seen Pearl’s devotion to Rose take a dangerous turn, but her masochistic mantra teaches us how scary channeling your self-worth in someone else can be (“When you live for someone, you’re prepared to die”). The glimpse at the battle for earth gives a stronger sense of Pearl’s dedication to sacrifice, and Steven’s discomfort with his best friend becoming a bodyguard is revealed early on. “Do It For Her” also tells us a lot about Connie (Grace Rolek) and the role she believes she plays in Steven’s mission—remember, a few episodes before, Steven tried to cut off their friendship completely to protect her; now she wants to prove that she can protect him. Garnet’s manifesto of love and strength—and the action that accompanies it—is easily one of Steven Universe’s strongest scenes. The execution of Estelle’s talent is flawless and brilliant, and her verse solidifies Garnet’s coding. Of course, for viewers in the LGBTQIA+ community, “Stronger than You”—and Garnet herself, the embodiment of a rock-solid queer relationship—are far more than a good montage or plot device. In Garnet’s own words, “But I am even more than the two of them… I am a conversation.” The Homeworld Gems may not approve of Garnet’s existence (some, of course, come around), but Garnet has a new home now, and she’s going to destroy anything that threatens her new sanctuary. Sarra Sedghi is Paste Food’s Assistant Editor. She cries about cartoons on a regular basis.